While much of what comes out of Nashville these days seems more tilted toward the rock side of things than country, there's not much in the way of true country-rock hybrids these days. 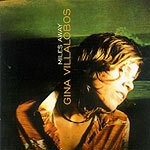 Gina Villalobos, who hails from Los Angeles, might not be able to re-ignite that country-rock genre all by herself, but her new album is surely a convincing argument that much remains to be mined in the territory between country and rock. Villalobos' distinctive vocals are the anchor here  sweet but with a bit of a burr to the edge, her voice is the perfect vehicle for her smart, insightful lyrics. Her songs have as much twang as her voice, but are underpinned by a rock beat. The instrumentation falls somewhere in between, with electric guitar and bass supplemented by pedal steel guitar and fiddle. Still, it's the songs that make or break an album: Villalobos is an even better songwriter than she is singer. Elegant melodic themes mark the 10 tracks here, complemented by a complexity that gives the band something to work with. The last two tracks are as strong as the first two, and if there's a letdown in between it escaped your loyal correspondent. Anyone who likes a twangy groove combining rock and country is going to find "Miles Away" added to their stack of fave listens.